I’m on a mission to make new friends. I’m in a new city, I don’t know many people, and I work from home on the Internet…. so, I’m really good friends with my cat, but at some point that’s just going to get weird. Meeting new friends in my 30’s, outside of the context of work relationships and school relationships has been interesting. By interesting I mean, um… how do I do this!? It seems that calling people, making plans, not flaking on plans, and making eye contact is a good start because I’m slowing amassing a group of awesome ladies in this new city. Slowly but surely. A few weeks before I moved to New Orleans from Los Angeles I received an email from Anna of The Yellow Table. 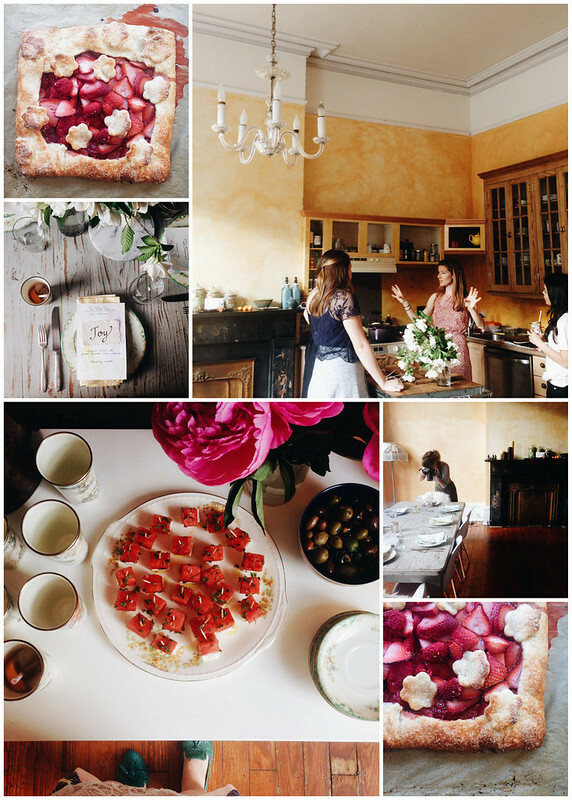 She was in the midst of planning her cross-country dinner party road trip to support her upcoming cookbook, and wanted to host dinner in my New Orleans home… that I didn’t even live in yet. I said SURE because it seems like once you start making crazy moves across the country, crazy dinner parties make total sense. The days run away, as they do… and before I knew it, Anna was in town with bags of groceries to cook in my New Orleans kitchen. Around the table we gathered a group of total strangers/new friends: Juley, Summer, Hannah, Rebecca, Anna, and Elise. We laughed, talked in the imagined voices of our pets, and shared the most lovely dinner of shrimp and couscous, watermelon and feta. I made this Strawberry Raspberry Crostata for dessert because making friends out of strangers often involves some sort of berry and fruit. Try it. Totally works. Recipes that start with this sort of beauty hardly seem fair. Summer is such a show-off. Fresh strawberries are rinsed and sliced thick. Fresh raspberries are rinsed and snacked on before adding by the handful to the strawberry bowl. We’re also going to need some sugar, cornstarch for thickening, a squeeze of lemon, and a dash of Grand Marnier because we’re fancy. I like how this feels. Last time I had fresh raspberries in the kitchen I made these Lemon Raspberry Pie Crust Cookies. 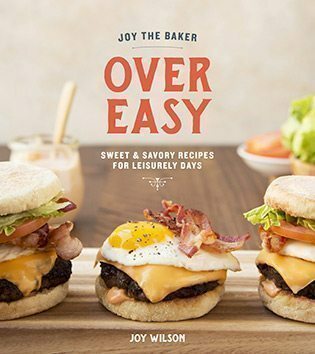 This recipe isn’t a grand diversion of those cookies. It’s just summer fruit and pie crust in a different form. 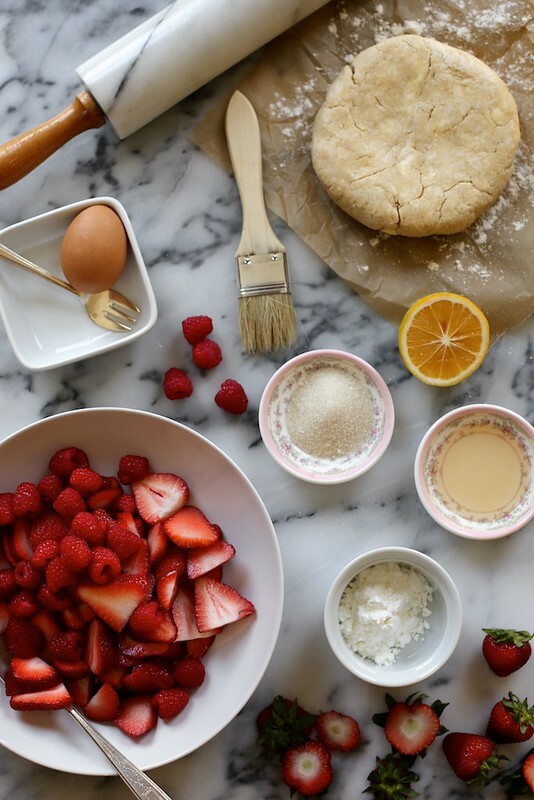 Berries, and their sugar and cornstarch partners. The sugar helps the extract juice from the berries (the strawberries especially). The process is called maceration. I add lemon, Grand Marnier, and salt for extra flavor flav. Pie crust with cold butter and buttermilk! This is enough crust for a double crust pie. We want to make sure that our crostata crust is thick enough to hold all of the fruit juice and goodness. Do you have a kitchen ruler? I do. Do you have a desk ruler? I don’t. Priorities, I suppose. With the extra pie crust, I cut flower shapes small and not so small. I don’t usually do this sort of cutesy thing but… it’ summer, and why not!? Plus, with the extra pie crust we can make little cinnamon sugar cookies. Not too shabby. Fruit and its juice is placed in the center of the pie crust. Also.. pro tip: place the rolled out pie crust square on the baking pan before it’s loaded down in fresh fruit. I still learn things the hard way from time to time. Folded up, egg washed, and dotted with pie crust flowers. Baked until golden brown, extra juicy, tender, and crisp. I like this best served just slightly warm with vanilla ice cream. It’s summer dreams come true. 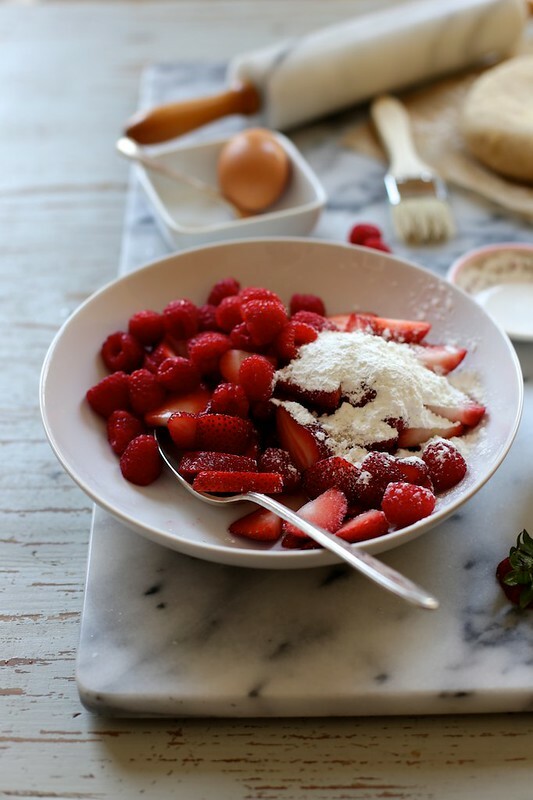 In a medium bowl, whisk together flour, sugar and salt. Add cold, cubed butter and, using your fingers, work the butter into the flour mixture. Quickly break the butter down into the flour mixture. Some butter pieces will be the size of oat flakes; some will be the size of peas. Create a well in the mixture and pour in the cold buttermilk. Use a fork to bring the dough together. Try to moisten all of the flour bits. On a lightly floured work surface, dump out the dough mixture. It will be moist and shaggy. That’s perfect. Shape into a disk, wrap in plastic wrap and refrigerate for 1 hour. Allowing the dough to rest in the refrigerator will help rechill the butter and distribute the moisture. 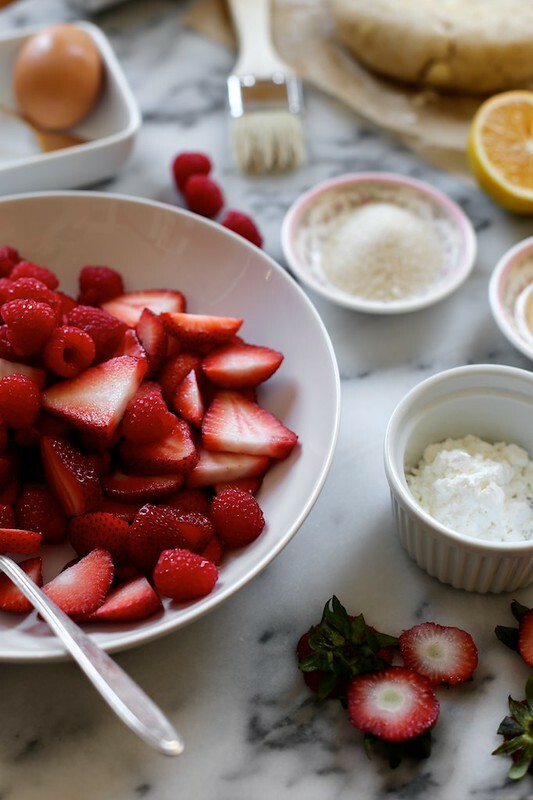 In a medium bowl, gently stir together strawberries, raspberries, sugar, cornstarch, lemon juice, Grand Marnier (if using), and salt. Try not to break down the berries too much but stir until all ingredients are well incorporated, and the cornstarch has completely dispersed and disappeared. Cover and set aside (room temperature or refrigerated) for 20 minutes. In a small bowl, beat the egg and set aside. In another small bowl place about 2 tablespoons of granulated sugar for topping. 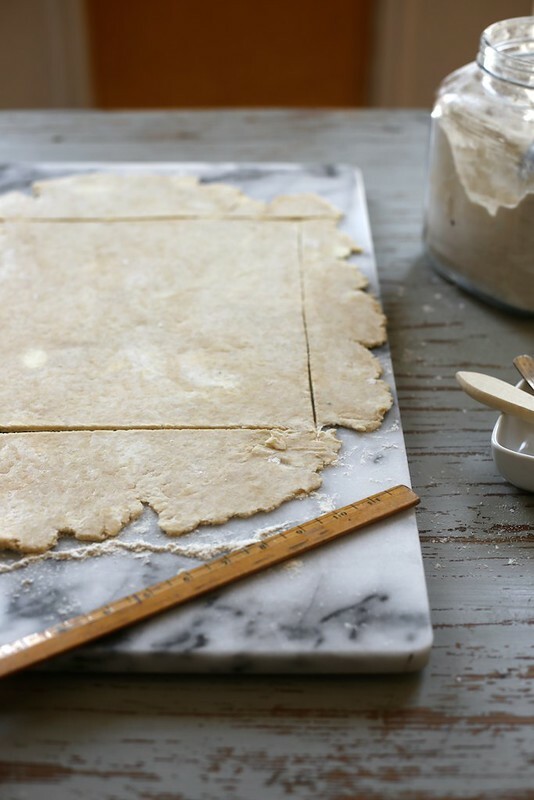 On a well-floured surface, roll one of the disks out to a 1/4″-thickness. Use a ruler to cut a 12-inch square out of the center of the rolled crust. 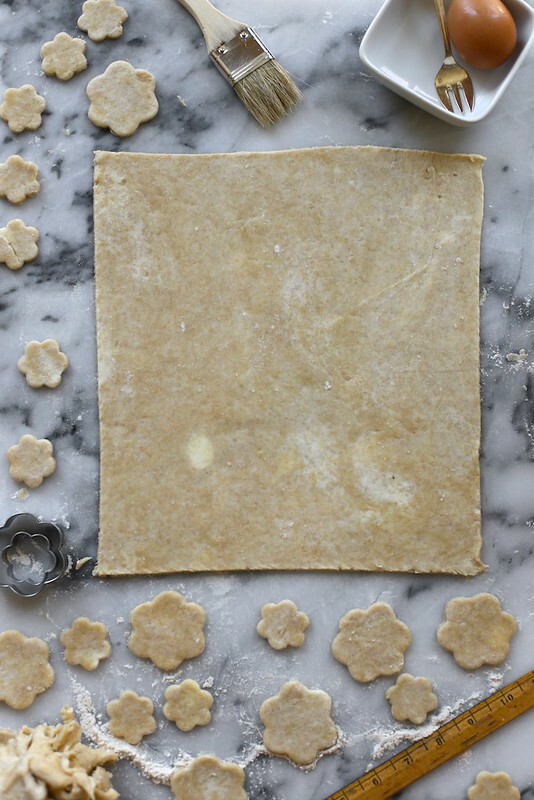 With the remaining rolled crust, cut our small flower, circle, or heart shapes using a small cookie cutter. 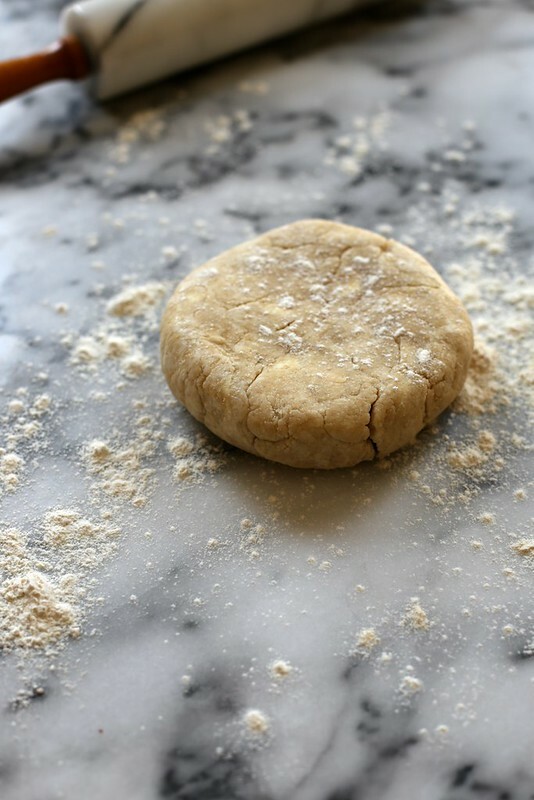 You may have some extra crust scraps that you can sprinkle with cinnamon and sugar and bake off as pie crust cookies! Preheat the oven to 400 degrees F and line a rimmed baking sheet with parchment paper. Place the 12-inch square onto the prepared baking sheet. Place the fruit (and most of the juice it produced) into the center of the square, leaving at least 1 1/2-inches of crust on all sides. Brush the edges of the square with egg. Fold the top and bottom of the square up towards the fruit. Fold the two sides up towards the fruit. 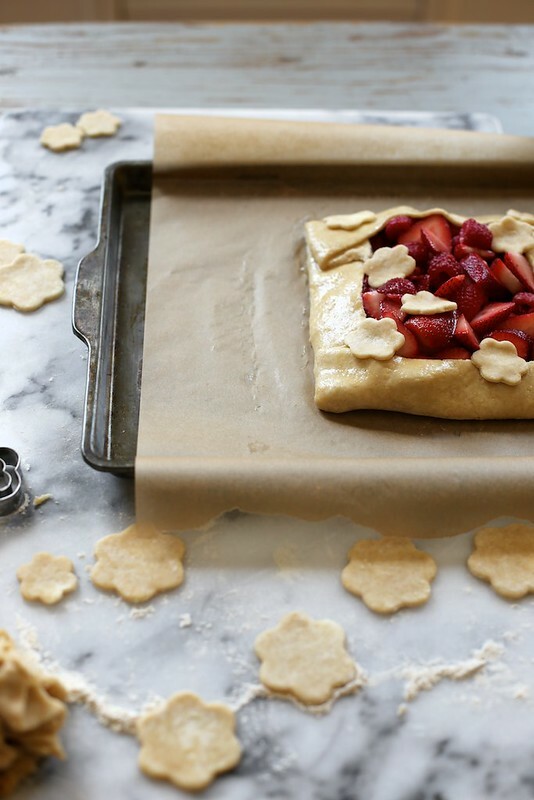 Place a few of the pie crust flowers (or circles or hearts) around the crust edges and among the fruit. Lightly brush the pie crust with egg and sprinkle generously with sugar. Place in the oven to bake for 25 to 30 minutes, until well browned and bubbling. It’s ok if some juices spill out of the crust during baking. Remove from the oven and allow to cool slightly (or cool to room temperature) before serving. To store, cover in plastic wrap and place in the refrigerator. Cover loosely in foil and gently reheat in a 300 degree oven for 30 minutes to serve warm from the fridge. Previous Post: « Let It Be Friday! I’m totally with you on this one, it feels like making new friends is dating when you are in your 30s. Akward/exciting/does this person really want to hang out with me?! I’ll take this tart and make friends with it please and thank you. This looks beautiful, as does the dinner you hosted! I’ve loved following along with The Yellow Table. Cheers to meeting more good friends in town soon! Cheers to that, and thank you for the comment! I am certain that if you keep creating such lovely creations, you will have the most amazing circle of friends in the city of New Orleans. 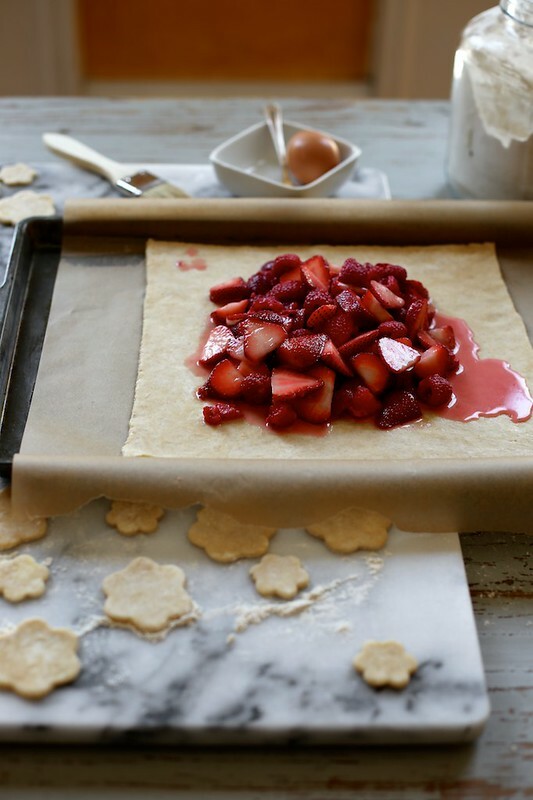 I do think I need a pastry ruler in my life… as a teacher I do have a few desk rulers floating around… Oh, and it seems I need some flower blossom pastry cutters as well… how adorable! 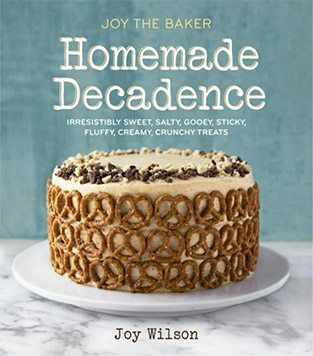 Oh, my goodness, this looks absolutely amazing. I love your style of photography (and your kitchen, and your marble slab – always wanted a marble slab). when i can’t have a full marble counter, a slab will do! it’s from crate and barrel if you need one! Summer is something I am wanting right now. it is freezing where I am but till it is back I guess I can lust over beautiful pie! making friends with food is the best idea! I’m in the same situation right now – I lived to Montreal, need to make friends, buuuuuut I don’t speak French, so I feel you. Wishing you the best of luck! Looks great and I love the tips as well. I would add my pie filling and then wonder how to get it onto my baking tray! Okay, like everyone else, I’m in lust with your adorable pie crust blossoms! How stinkin’ cute! And I totally need a “How To” book on making friends once you’re an cult because I don;t even know where to start. Talking in the voice of my cat is absolutely the way I test if someone is a person who will be a true friend or not. If they respond in line, they’re in;) have I mentioned it is sometimes hard being me? gorgeous, i adore the pie crust flowers! The pie crust flowers are such an inventive and adorable way to use the extra crust! Really makes it feel so summery and festive. 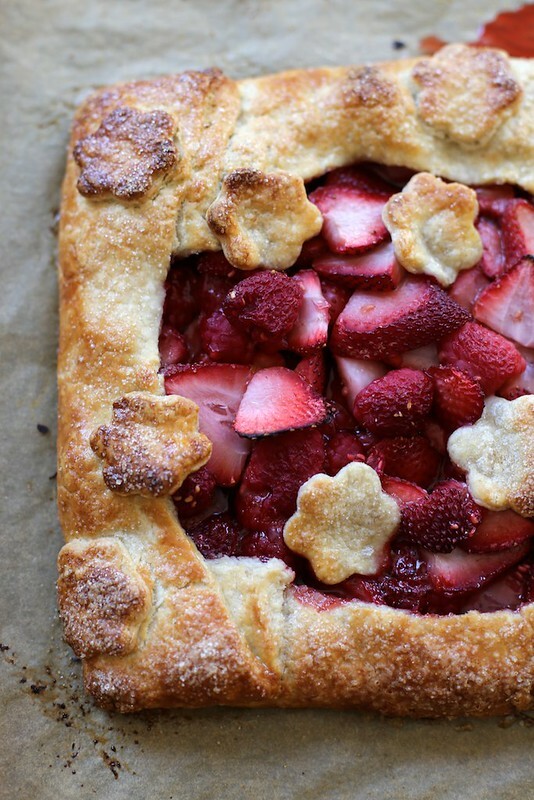 The pastry on this is so gorgeous and strawberry/raspberry is always a welcome combo. Looks delicious! Also, your photography is getting more and more beautiful! I love these photos!! Keep it up, lady!